Registration will close on Saturday, August 7th, 2010.
for Candidates who made Ambrose Alli University, Ekpoma 1st and (or) 2nd choice Institution and who now desire to apply for the B.Sc. Nursing degree, and meet the JAMB requirements may also apply. Such candidates must have credit passes in at least five subjects which must include Physics, Chemistry, Biology, Mathematics and English at one sitting. Please buy your form early; i hate late registration, because of the stress attached to it. and i will stop collecting form when it is close to the late period. We can as well help you to purchase and register your AAU POST UME form, regardless of where you are. Charges is N2500 including online processing. A functional e-mail addresses and Mobile Numbers to enable the University to reach you in the course of the Admission Exercise, whenever the need arises. If you do not have a personal email address do not worry I will create for you. The screening exercise for the various Faculties is scheduled to take place on the following dates at 9.00 am on each day. Candidates are expected to report at the venues of screening at 7.30 a.m. prompt. Subjects for Screening: Candidates will be screened in subjects relating to their 1st Choice course of study in Ambrose Alli University, Ekpoma. 1. 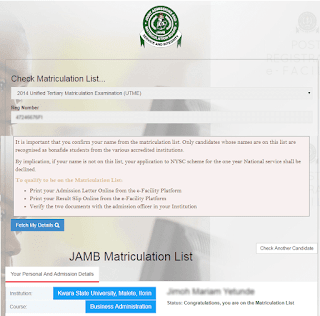 UTME e-registration slip and UTME result slip. 2. Two coloured passport photographs. 3. HB pencil and Biro. 4. A print-out of the duly completed Post-UTME Online Application Form. 5. A copy of O’Level Result(s), if available. (a) Any candidate who fails to appear for the screening exercise automatically forfeits his/her eligibility for consideration in the current session’s admissions exercise. (b) Anyone caught impersonating will be handed over to the Police and the candidate so impersonated will automatically be ‘disqualified’. I just succeed in upgrading my JAMB from Mr Olaniyi a JAMB official call him now if you don't want to sit for another JAMB this is confirmed i did not just get his number like that it was my friend he helped that gave me the number and it work perfectly for me i have my new score which is 249 and i have just printed it.